This classic game is of marginal interest to my 4-year-old, but as she gets better at seeing the patterns, she’ll like it more. The new legs and flip-switch to drop the pieces are solid enough. No complaints! It’s okay. 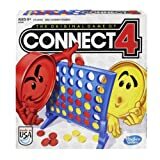 It’s your basic connect 4 game… If its Good enough for my students, it’s good enough for me!! !